I first read about this bakery years ago in The Boston Globe and thought I had caught a rare Globe editing error. “An doughnut” was a mistake surely the writer meant “a doughnut”? The writer did not. The An doughnut is a red bean paste (azuki) filled doughnut (made seemingly of sunlight and air) and then covered with granulated sugar. Okay, I kind of love this treat. Lest you think that I am eating only pure sugar, I also had the most prettily packaged sandwiches. Choices include egg salad (I am particular, theirs is divine), tuna salad, ham or turkey. 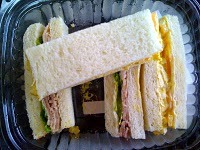 The sandwiches are on a soft crustless bread (regular shoku pan) and are substantial enough for lunch. Great looking salads and other pastry items, too. The hands-down favorite is Heavy Cream Shoku Pan which is traditional Japanese white bread made with heavy cream. My youngest calls it the white fluffy bread. All is lovely, both service and food. thanks for checking out my blog. i eat lunch there with some frequency. i’m glad to hear you like it too! I love Japnonaise bakery and wanted to mention that they have an outpost in Porter Square in the old Sears building, now called Porter Exchange on Mass. Ave., that is now has a little Japanese food court. Part of Leslie College is in the same building and there is partially validated parking in the back. The restaurants are all good too!